The Jackson Institute for Global Affairs celebrated its graduates today with a diploma ceremony and lunch at Horchow Hall. The Institute awarded 28 M.A. degrees and one M.A.S. degree in Global Affairs. Jackson graduate students started the day with a 10:30 a.m. ceremony at Yale’s Old Campus, where the University symbolically conferred degrees on all undergraduate and graduate students from the Class of 2018. Jackson student Zachary Devlin-Foltz M.A. ’18 served as marshal and accepted the symbolic diploma for M.A. graduates. Beginning at 12:30 p.m., the Jackson Diploma Ceremony opened with welcoming remarks from Professor Lloyd Grieger, Jackson’s director of graduate studies. Grieger reflected on the benefits—and the scrutiny—that comes with attending a prestigious Ivy League institution, using Yale’s motto “Lux et Veritas” as a metaphor. “The light here at Yale is bright—in and out of the classroom—and as graduates, you now inherit this light. You are now carriers of this light—and everywhere you go, you can shine it in the furtherance of truth,” Grieger said. “So, after you leave here, and every time you look at your diploma and see the inscription Lux et Veritas, I hope you’ll remember that those things—light and truth—are among your greatest tools. And that you’ll ask yourself, where will I shine my light? I know that I speak for everyone here at the Jackson Institute—your teachers and mentors especially—when I say that we are all really, really eager to find out where you’ll shine your light,” he said. The ceremony also included remarks from Roberta Allport M.A. ’18, who was selected by her classmates as speaker. Allport reflected on the broad diversity of her cohort, a “passionate, brilliant group of people” who speak 18 languages and represent 15 different countries. She encouraged her classmates to be confident and to keep sight of their goals. “Let us step into this world with confidence, with a sense of peace, with the knowledge that through our own abilities, through the skills and training that we have acquired at Jackson, through the support of our friends, colleagues, peers and mentors that we will achieve the goals that we set for ourselves, that we will surpass these goals, that we will have pleasant surprises that we didn’t think to even conceive of as goals,” Allport said. “I hope that we always remember that a career in global affairs is less about ourselves, and more about the people that we hope to serve,” she said. Two students received awards for outstanding academic achievement. Ellen Chapin M.A. ’18 received the Award for Academic Excellence in Global Affairs. Jillian Anderson M.A. ’18, MBA ’18 received the Miguel Ferreyros Memorial Award, which is awarded to the joint-degree student in Global Affairs with the highest academic achievement. Jackson’s director, Professor James Levinsohn, closed the ceremony. The day wrapped up with an outdoor luncheon with Jackson graduates and their families. 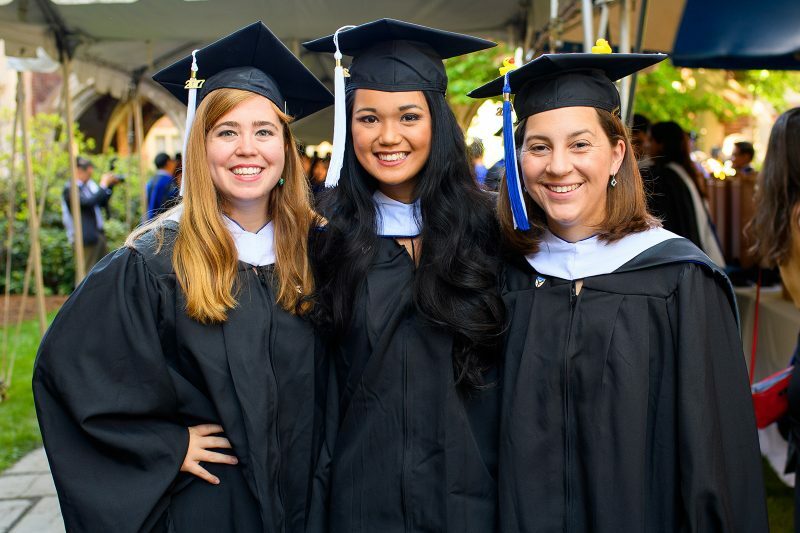 Jackson also congratulates its Class of 2018 undergraduate Global Affairs majors, who received their diplomas in separate ceremonies at Yale’s 14 residential colleges. Interested in seeing more coverage from Yale Commencement 2018? Go to commencement.yale.edu.